Strange, but I am no longer working as a Lecturer at Newcastle College. The decision to take voluntary redundancy felt right at the time, and I do not feel any different about that now, moving forward. Since then I have been back into College on 4 days, and some of this blog entry is about what I was getting up to back in the old haunt. I have to say, I was on holiday at the time, and was lucky enough to be indulging myself in lots of fun with a favoured pass time; namely, making lots of lovely breads! I spent 2 days on production, then I had a teaching contract for a day to earn some money, then a trip in to collect all the bread I had made the previous week, and say a final goodbye to the few people there. 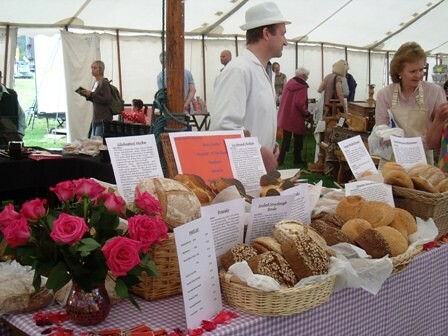 My mission was to make a range of craft and genuinely artisan breads which I could sell at our Village Show, here in Powburn, which took place on Saturday 6th August. The write-up follows below. 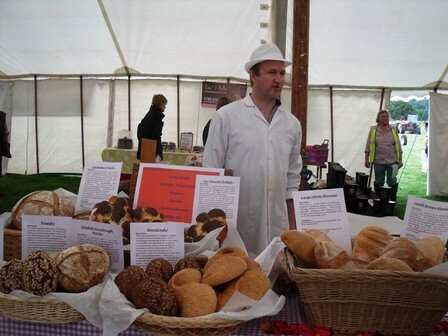 I negotiated an agreement with my previous line manager in College, allowing me to have 2 days working in the Bakery Kitchen to produce a range of breads for myself to sell at the Show. I then wrapped and stored all the produce in the “walk-in” freezer, and met up with the Stores Manager on Friday lunchtime to collect all the bread and transport it to Northumberland ready for the Show. I worked over Tuesday 26th and Wednesday 27th July, with some valued assistance from an ex-student, Dgilly, on the first day: thank you for that my friend! There are some photographs below taken during both production sessions. 12 Pane Siciliano, using an overnight Biga with some Gilchesters Pizza/Ciabatta flour and authentic Italian Semolina Flour [coarse, not re-milled]. The formula is posted below. All the bread was wrapped and frozen as soon as it was cooled, and labelled for easy identification. It was neatly stacked in baskets on a set of dolly wheels, so we could transport it easily to load to my car. In the meantime Alison went shopping to our newly re-furbished village Antique Centre and came back with some lovely large display wicker baskets and a huge piece of purple gingham cloth to use to cover the stall table which I had paid for. The cloth had been made a by a company calling themselves “artisan”…how appropriate! I called into the Bank for change for a float, late on Friday afternoon, and we made a last minute call out to the family for a proper cash box to use as a till. Alison’s Dad came up trumps; thanks Maurice! The other work was on the publicity side, and I have been given so much support here by Alison’s sister, Beverley, who works for a printing company in Cramlington. Here’s a plug for Ravensworths, who have done me absolutely proud; thank you all, so much. Standards introduced in the Soviet era. Originally considered to be a loaf to commemorate victory in the Battle of Borodino in 1812, this version of the bread uses a Rye Sourdough plus a zavarkha [boil-up] of molasses, malt, rye flour and boiling water. The 2 are combined to form a sponge. This is then used with further flour to form the final paste. 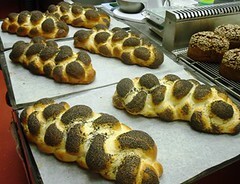 Considered to be “The Prince of Russian Breads” Bitter-sweet overtones with an aroma given off from the freshly ground coriander seeds. Salt constitutes less than 1% of the baked bread weight. 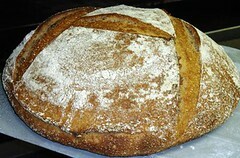 This loaf is made with a ripened white leaven as the pre-ferment at 37.5% of the total flour. The remaining flour in the final dough is a wholemeal bread flour. The leaven brings strength, maturity and flavour to the dough and produces a wonderfully bold and attractive, tasty loaf. There is a small amount of bakers’ yeast and vegetable fat added to the final dough. Wholemeal Bread Flour, White Bread Flour, Water, Salt, Fresh Bakers’ Yeast, White Vegetable Fat. Salt and Vegetable Fat constitutes approx. 1.2% each of the baked bread weight. 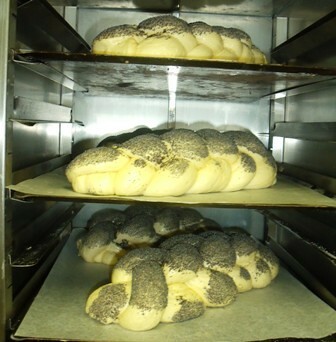 This loaf is used as the centrepiece for certain Jewish Festival meal celebrations. There are lots of different plaits which can be used. 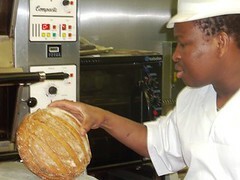 The idea is to produce a showcase loaf which allows those participating to tear off portions of the bread, as a knife is not allowed to be used. The bread is enriched, and I have used a short pre-ferment to encourage a reliable fermentation, plenty of loaf volume and the best flavour in the finished bread. Note that this bread is sweetened, and that butter is also used, in addition to milk in place of the usual water. A considerable amount of egg brings further tolerance in the dough through all the process stages. White Bread Flour, Water, Milk Powder, Sugar, Butter, Egg, Salt, Fresh Bakers’ Yeast. This loaf is leavened solely with a wheat levain maintained using white bread flour. The flour in the levain constitutes 27% of the total flour in the recipe. The remaining 73% of the flour is Gilchesters’ Organic Farmhouse flour [a high extraction flour, approximately 85% wholemeal]. 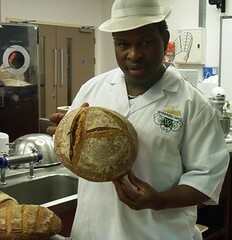 This means the bread is made using largely locally grown and processed ingredients. Gilchesters grow single strain, tall-stemmed organic Sativa wheat on their farm near Stamfordham. This is stoneground to flour at their own mill, the only mill to be installed in Northumberland in the last 150 years . Salt constitutes approx. 1.2% of the baked bread weight. This loaf is leavened solely with a rye sourdough culture for plenty of flavour. The rye constitutes 25% of the total flour in the recipe, the remainder being white bread flour which gives a lighter eating texture . This loaf has been made with an overnight pre-fermented dough called a “Biga”, using a very small amount of Bakers’ Yeast plus half the total flour in the formula. The final dough contains a mix of half authentic Italian Semola di Grano Duro giving a hint of straw colour to the dough, and the finished crumb. The remaining half of the flour comes from Gilchesters, being an Organic Pizza/Ciabatta flour, very finely milled . The shaping symbolises the eyes of Santa Lucia watching over the faithful. The legend is that Lucia refused to marry a Roman General as she had devoted herself to God during the pre-Christian Roman era in Siciliy. This loaf is made only with 100% whole rye flour, red malt, salt and water. 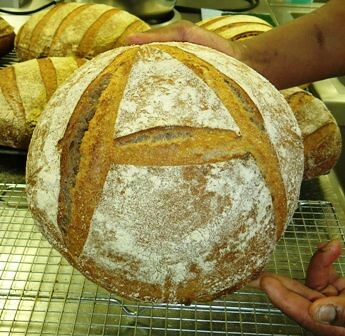 It is leavened with a rye sourdough culture only, with no added bakers’ yeast. 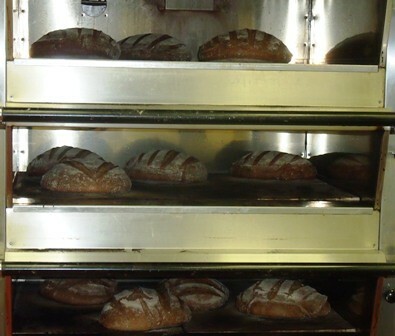 The sourdough is given a full 18 hours fermentation before it is used to make the final paste. The most basic of the Russian sourdough rye breads; this panned version has a topping of Organic Rye Flakes to give an attractive appearance and some extra texture to the crust. Salt constitutes approximately 1% of the baked bread weight. This loaf is leavened with a rye sourdough culture and a wheat levain for plenty of flavour. 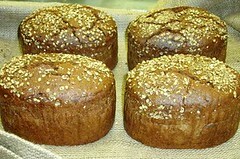 A soaker of golden linseeds in cold water is also used, in order to encourage high hydration in the dough. The dough is retarded overnight for more flavour. 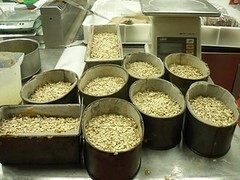 The other seeds used are roasted in the oven before being added to the dough. The final dough has a portion of wholewheat flour added along with white bread flour. This loaf is made with a yeasted pre-ferment, commonly used in French bread baking, called a “olish”. This brings strength, maturity and flavour to the dough and produces a wonderfully bold and attractive, tasty loaf. White Bread Flour, Water, Salt, Fresh Bakers’ Yeast, White Vegetable Fat. Still feeling sleepy on Saturday morning, I loaded up the car while Alison provided an essential breakfast of fruit and yoghurt with espresso coffee enabling me to come fully to life. The weather was wonderfully sunny first thing, although we were aware the forecast for the day was not good…as is, apparently, frequently the case for the annual event in Powburn! The Show began to fill with people, and the weather turned to rain, as the forecast had promised. It did not, however, detract from what became a really successful and enjoyable day. I sold 70 loaves, with just 6 left to bring home. Financially, I netted just over £200. However, the biggest coup was all the favourable publicity, and the interest generated amongst fellow local traders and those visiting the Show. 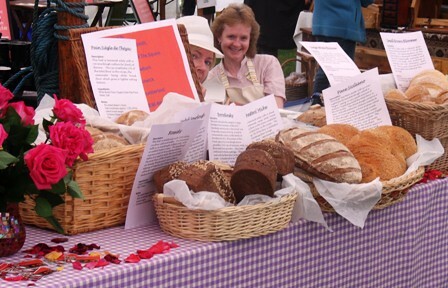 I was overwhelmed by those committed people out there, selling local and really special food, taking such an interest in what I had done, and clearly impressed with the integrity and authenticity of the breads I had made. It made me realise it was all worthwhile. As you can all imagine, I have been taking numerous steps to carve out a new and more exciting destiny for me, and for Alison, in the months and years to come. This adventure at the Powburn Show was a big and fun part of the plan. Some photographs of the day are shown below. “Bread and Roses” is the theme I’m using. 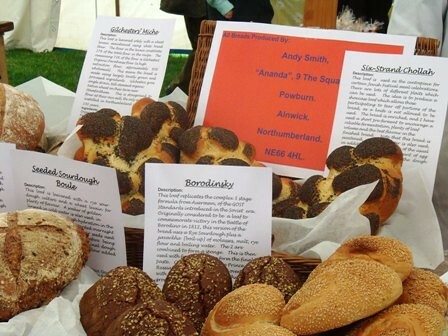 How very apt: the loaves which sold out first were the most specialist, special and…expensive! 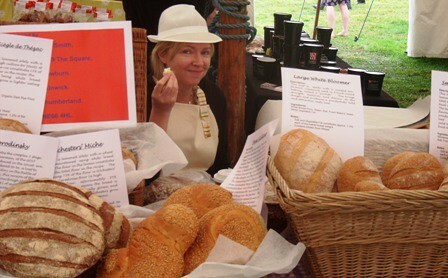 The “Chollah” was a hit, and interest in both the Russian sourdoughs was just so fantastic too! The biggie was the Gilchesters’ Miche. That was so pleasing for me. I have put a lot of work into perfecting being able to work with this flour, as various blog posts will testify to. Everyone was fascinated by the local aspect and the details concerning the wheat being grown and milled here in Northumberland. This is just great; it confirms that the small producer has to produce food which is genuinely nourishing and sustaining, in all aspects. It also has to be really special, and something the large producers are neither able, nor willing, to try to poach, rip-off and ruin. Lastly, thank you to all my family for support and utter belief in me; especially to Alison, of course, for wanting to share my vision as part of our journey together as life partners.